"This gravy comes out perfect every time. The cream of chicken soup is what gives it wonderful flavor. Nice and creamy, never lumpy." Warm the milk in the microwave, and whisk in the flour with a fork until there are no lumps. Return the gravy to a boil, and gradually stir in the milk mixture. Continue to cook, stirring constantly, for 1 minute, or until thickened. Be careful not to let the bottom scorch. I'm not sure what I may have did wrong but this gravy had no color, even a bit greenish! Taste was good, finally thickened with added cornstarch, not with standing as recipe suggusted. This gravy has an awesome flavor. It does thicken upon standing for a few minutes. 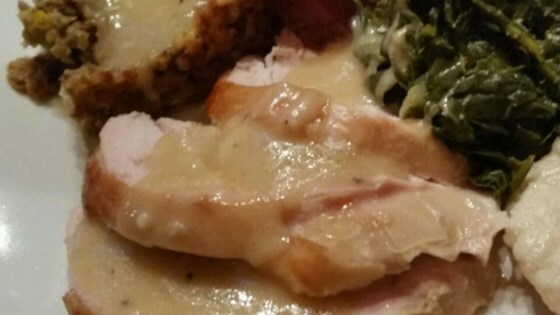 This is my new annual turkey gravy recipe!